A four bedroom detached property with commercial potential. These premises already has planning granted for a creche. There is a detached garage to the side and a large garden to the rear of the property. 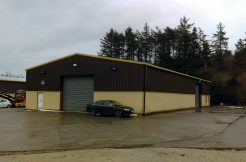 Located on the Newtowncunningham to Derry road only 5km from the village of Newtowncunningham and 10 mins drive from Derry.